Nayna, very delicious looking and of course healthy pooris. Will surely try them as I have bajra flour. I don't think, or at least, I haven't seen fresh fenugreek leaves. I use fenugreek seeds but I think my fellow Indian friends can help me find these leaves before I can try this recipe out. 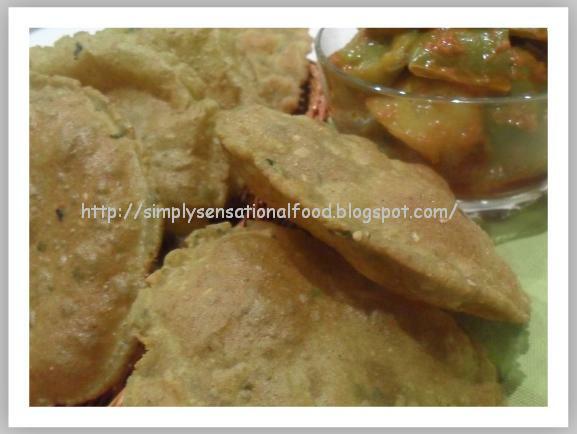 Wow..bajra ni puri..tempting! looks lovely..must be taste like vada? love it with cup of tea or pickle..
Looks delicious. Puri puffed up nicely. Millet flour poori looks really good. You reminded of my school days. My best friend used to get this for tiffin.. Thanks for sharing! Poori looks good. Nice combo with the flour! 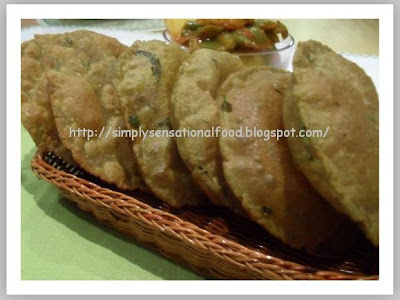 Loved your version of savory poori...so full of flavors..
New poori recipe.. sounds good, healthy too! Very creative poori, never thought of making out pooris with bajra flour, thanks for sharing.. Very Nice Bajre ke Puri. Awesome looking & must have tasted great. Crispy and yummy puris..Great recipe!! Essa receita é deliciosa e a foto do prato belíssima!!! Wow this is something new to me! Puris look very tasty! Can I use Jowar instead of Bajra flour? This looks fantastic! Puffed perfection! Where can I buy millet flour? Thanks for taking part in Breakfast Club #1: Asian. Check back in a few days for July's theme.